Situated in beautiful countryside with many coastal, hilly, floral and forest tracks leading off the farm. Your horse will be cared for 24-7 in ideal equestrian surroundings. woodchip arena (40 x 30m approx. ), lunge arena, dressage arena and horses' wash-bay. Our cross-country jumps, TREC PTV obstacles and International Show Jumps, are available for our livery owners use under supervision of Tiffany's instructors. There is also parking for horse-trailers and a classroom if required. Use of facilities as above. Secure paddock with field shelter. Extras Private lessons with Tiffany €10.00 per hour. Private lessons with Deborah €8.00 per hour. 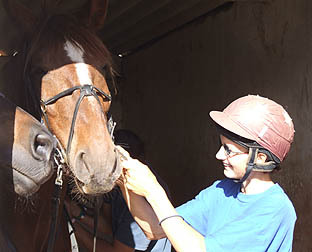 Visiting trainers fee €5.00 per hour. Straw or shavings bed €100.00 per month.